This section focuses on the commodities (or taxon/term/unit combinations) exported at high volumes by the EU and candidate countries. For the purposes of this analysis, trade volumes over 1000 units were considered as ‘high volume’. Commodities exported by the EU and candidate countries at volumes exceeding this threshold in 2012 are discussed below for each taxonomic group. Commodities met the ‘high volume’ criterion on the basis of direct and indirect trade combined; however direct and indirect exports are presented separately in the tables with direct exports first, followed by indirect exports. High volume exports were recorded for 11 mammal, 16 bird, 29 reptile, 11 fish, five invertebrate, 15 plant (other than timber) and six timber taxa. In 2012 there was a notable increase in the number of reptile taxa traded at high volumes, from 19 in 2011 to 29 in 2012, mainly due to an increase in exports of snake skins and live tortoises. The following sections provide an overview of the high volume trade by taxonomic group. Eleven mammal taxa met the high volume criterion in 2012 on the basis of at least one term/unit combination. The top commodities exported directly from the EU by taxon were garments derived from the species Lynx rufus and L. canadensis (all reported without a source or purpose) and captive-bred specimens of Macaca fascicularis exported for medicinal purposes. The top mammal commodities re-exported were hairs of Mustela sibirica, specimens of Macaca fascicularis and skins of Arctocephalus pusillus. Notable quantities of pre-Convention carvings of Loxodonta africana were reported in 2012 compared to previous years; this trade is discussed further in the box below. Mammal species/term/unit combinations for which EU-reported (re )exports (combined direct and indirect trade) exceeded 1000 units in 2012. *Indicates species that did not meet the high volume threshold in 2011. A total of 5616 L. africana carvings recorded as pre-Convention (source ‘O’) were exported by the EU in 2012, more than double the quantity reported in 2011. Of these, 1248 carvings were reported in sets of 52, and are therefore likely to be piano keys. All exports of carvings in 2012 were reported as Annex A, with 99% reported as re-exports from an unknown origin country; the majority (75%) of trade was for commercial purposes. The United Kingdom accounted for 88% of exports in 2012; the top trading partners were China (37%) and the United States (28%). EU-reported (re-)exports of pre-Convention Loxodonta africana carvings, 2003-2012. Fifteen bird species and one hybrid met the high volume criterion in 2012 on the basis of at least one term/unit combination. Commodities meeting this threshold were primarily direct commercial exports of live, captive-bred birds; the vast majority of the indirect exports originated within the EU. The top commodities in trade by quantity were feathers of Cairina moschata (kg), live Agapornis fischeri and live A. personatus. Bird species/term/unit combinations for which EU-reported (re )exports exceeded 1000 units in 2012. * Indicates taxa that did not meet the high volume threshold in 2011. Twenty-nine reptile taxa met the high volume criterion on the basis of at least one term/unit combination in 2012. Direct exports from the EU were primarily live, captive-bred specimens traded for commercial purposes; Chamaeleo calyptratus accounted for 48% of direct exports of live reptiles in 2012. The principal importers of live reptiles were the United States (30%) and Hong Kong, SAR (28%). Re-exports of taxa which met the high volume threshold primarily comprised skins or skin pieces. Alligator mississippiensis accounted for 93% of re-exports of skin pieces, of which the principal importer was Tunisia (42%), while the main EU re-exporter was France (98%). Reptile species/term/unit combinations for which EU-reported (re-)exports exceeded 1000 units in 2012. *Indicates species that did not meet the high volume threshold in 2011. No individual species exceeded the 1000 unit threshold; the principal species exported were Dendrobates tinctorius (508 live animals; 25%) and Ambystoma mexicanum (360 live animals; 18%), of which the majority were captive-bred and exported for commercial purposes. The majority (94%) of live amphibian exports from the EU were direct; the top EU exporter was the Netherlands (58%), while the principal importer was Japan (44%). Eight fish species and three hybrids met the high volume criterion on the basis of at least one term/unit combination. The vast majority of high volume direct exports involved sturgeon commodities from captive sources, exported for commercial purposes; live eggs were the top commodities exported by quantity. Acipenser baerii was the top species exported as live eggs, representing 84% of the trade in this commodity; all were directly exported from France to China. Fish species/term/unit combinations for which EU-reported (re-)exports exceeded 1000 units in 2012. * Indicates species that did not meet the high volume threshold in 2011. Five invertebrate taxa met the high volume criterion on the basis of at least one term/unit combination in 2012. Hirudo medicinalis accounted for 80% of exports of live invertebrates reported by number, all of which were captive-bred and exported directly from the EU for commercial purposes; the top EU exporter was France (81%), while the principal importer was the United States (72%). Invertebrate species/term/unit combinations for which EU-reported (re-)exports exceeded 1000 units in 2012. *Indicates species that did not meet the high volume threshold in 2011. An overview of the 15 plant taxa that met the high volume criterion is provided below. 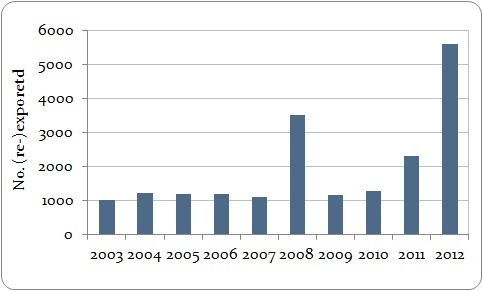 Taxa directly exported at high volumes in 2012 primarily comprised Appendix I cacti exported as artificially propagated seeds for commercial purposes; the majority (90%) were exported from Malta to China. 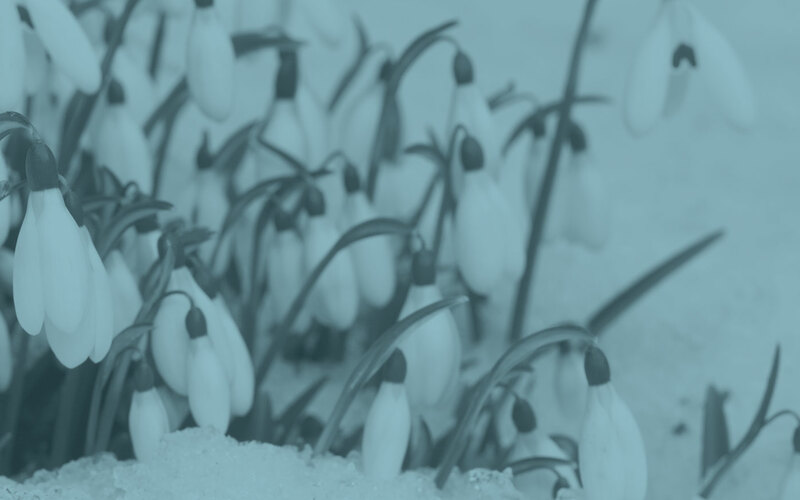 Wild-sourced Galanthus elwesii accounted for 92% of live plant re-exports from the EU in 2012, all of which originated in Turkey and were re-exported via the Netherlands; the principal trading partner was Japan (88%). Non-timber plant species/term/unit combinations for which EU-reported (re-)exports exceeded 1000 units in 2012. *Indicates species that did not meet the high volume threshold in 2011. Six individual timber species met the high volume criterion on the basis of at least one term/unit combination in 2012; the majority of this trade was wild-sourced. Prunus africana accounted for all of the trade in bark, the majority of which (90%) originated in Cameroon and was re-exported via France to Madagascar. Araucaria araucana was the only timber species exported at high volumes from the EU in 2012 for which a proportion of the trade was direct; the majority of the direct exports (all live specimens) originated in Italy (52%), while the top importer was Switzerland (69%). Timber species/term/unit combinations for which EU-reported (re-)exports exceeded 1000 units in 2012. * Indicates species that did not meet the high volume criterion in 2011. Candidate countries exported ten commodities (species/term/unit combinations) at volumes exceeding 1000 units in 2012, with the majority of trade for commercial purposes. Species/term/unit combinations for which candidate countries’ reported (re-)exports exceeded 1000 units in 2012. *Indicates species which did not meet the high volume threshold in 2011. Iceland’s annual report for 2012 has not yet been received. High volume direct exports from candidate countries, in addition to the trade in plants described in the wild-sourced trade section, primarily comprised live, captive-bred tortoises for commercial purposes; the principal importer was the United Kingdom (37%). Other than live Galanthus woronowii, the majority of high volume re-exports by candidate countries comprised skins, the majority of which were wild-sourced and all traded for commercial purposes; the top importers of the taxa re-exported at high volumes as skins were China (24%), Russia (23%) and Spain (23%).